Click here to see Breast Collars we have made in the past for ideas for your custom breast collar! 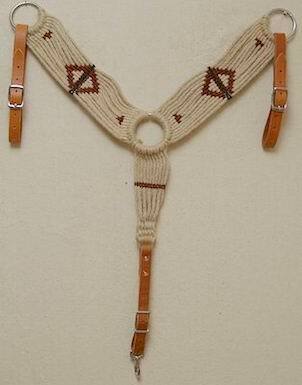 How to measure your horse for a custom breast collar. 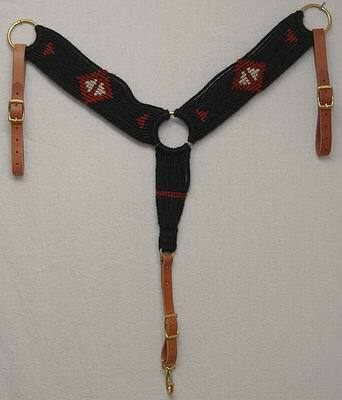 Breast Collars In Stock For Sale! Sides are 13 strands & 3 1/2” wide by 17 1/2" from center of center ring (3") to outside of end ring (21/4"). **Some custom colors available! Colors other than what we show may not be 100% Mohair. 1. Black or natural mohair for the main part of the breast collar. 2. Color of accent yarn desired. 3. 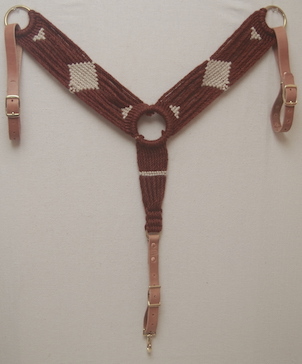 Color of leather straps. 4. 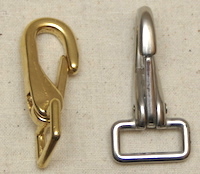 Nickel or solid brass hardware. 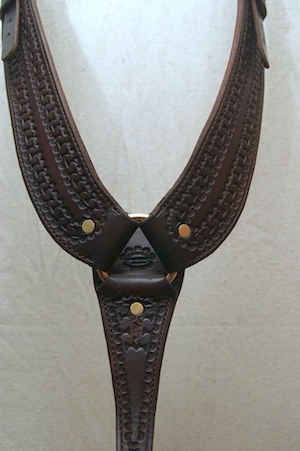 *From where the breast collar will attach to your saddle down to the center of the chest. *From the center of the chest to your cinch. 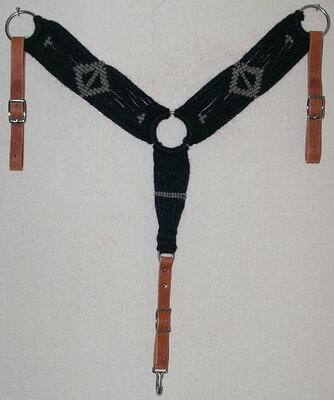 The standard set of straps will be made out of skirting leather or harness leather, oiled or stained, brass or chrome over brass hardware. Side Straps will have 1” Buckles . 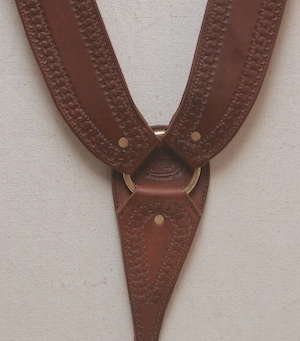 Bottom Strap will have a 1” Snap & 1” Conway Buckle. If you have a smaller horse or a larger more muscular horse, measurements may be necessary to determine appropriate strap length. *See picture below of Gator Snap. Flat on the bottom and locks closed if desired. *Snaps on the side straps won’t work if you are going to attach the straps to your rigging ring because the snaps would be too small.